Westmount’s Roslyn Elementary principal, Nick Katalifos, worked hard on the school’s $800,000 outdoor renovation project. “We are very proud, very proud and very excited about it,” he said. A big priority was erecting a new, galvanized steel fence around the entire school. At six feet tall, the fence now meets school board code requirements, unlike the former one, which was only four feet tall. But the school has come under fire from some local residents, who complain the new fence is much too big, and too ugly for the area. 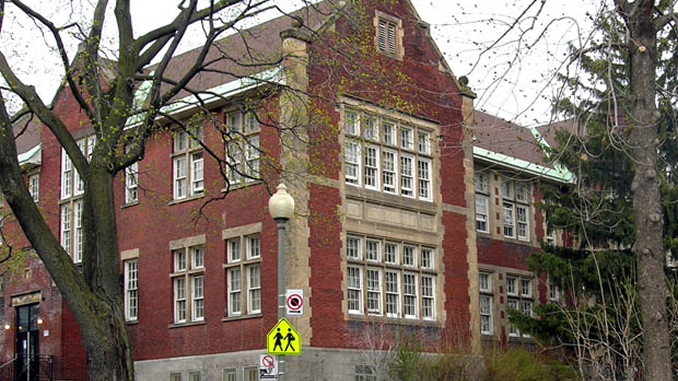 The school also faces trouble with the City of Westmount. The front of Roslyn never had a fence. But the school erected one, hoping to create an outdoor garden run by the kids, who would donate the vegetables to local food banks. They forgot to apply for a permit for that section of the fence, though, so the city says it must come down. As for the rest of the fence, residents are pressuring the city to force the school to plant hedges to hide it. Roslyn Foundation board member argued what residents want will cost money. She feels some residents are out of touch with the reality of running a public school. The school promises to comply with local bylaws and tear down some of the fence if necessary, and plant trees. The principal is just disappointed it’s all going to cost money he believes would be better spent on his students.